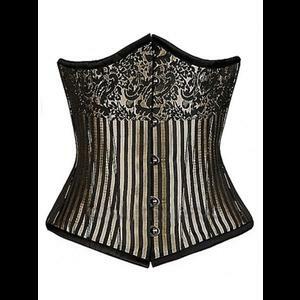 An underbust corset made from black and pale antique gold striped brocade with a vintage floral design at the top. The stripes around the waistline help to give the impression of an elongated body. The corset is fully steel boned with 14 flat bones and a front busk fastening. The back of the corset has strong metal eyelet and cord lacing with a very generous modesty panel. Fine cotton twill lining. Length is 10". Please note that it is generally advised to select a steel boned corset at least 2" smaller than your actual waist size to offer a potential waist reduction of 4" to 5"